The owners 2nd Floor Master Suite, is made available to guests who rent The Penthouse for up to 12 guests only. 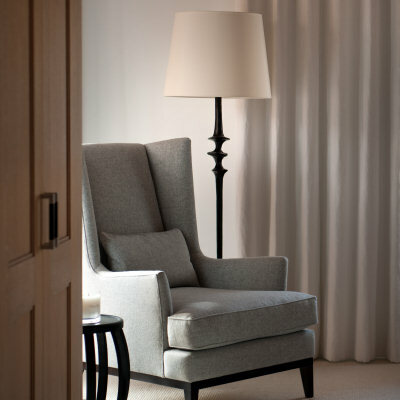 Home comforts from The White Company are everywhere in all of the bedrooms from blissfully comfortable beds (complete with toppers, goose down duvets & pillows) to high thread count cotton sheets, luxury bath robes, super-soft towels, soothing scented candles and pampering bath products. The 2nd Floor Master Suite is a wonderfully spacious bedroom with a view of the mountains and a balcony. Complete with a luxury 6ft super-king bed, dressing table/desk, hairdryer, a Bose speaker with lightening port, ample cupboard/ drawer space, reading chair and a magnificent en-suite bathroom. The bathroom offers twin sinks, a deep freestanding bath, separate walk-in shower and WC. Pampering bath time treats from The White Company include a relaxing scented candle, hand wash & hand cream, shampoo & conditioner, luxury bath & shower gel and body lotion. "The penthouse bedroom is a cream and white paradise, with accents of soft grey and a bed I melt into."